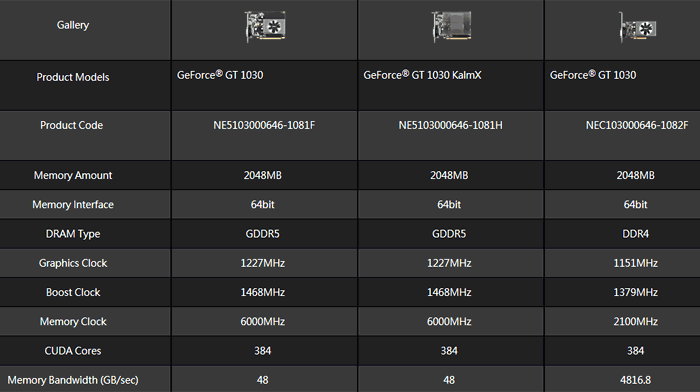 Several well known AIB brands have quietly released graphics cards which differ rather strikingly from Nvidia GeForce GT 1030 reference card specs. As uncovered by Tom's Hardware, the MSI GT 1030 2GD4 LP OC, Gigabyte GT 1030 Low Profile D4 2G, and Palit GeForce GT 1030, all come with DDR4 RAM on board rather than GDDR5 memory. A reference GT 1030 employs 2GB of GDDR5 RAM at a speed of 3GHz, doubled up to deliver and effective 6GHz, on a 64-bit memory bus. This provides memory bandwidth of 48GB/s. However graphics cards such as the MSI GeForce GT 1030 2GD4 LP OC with their 2GB of DDR4 RAM and a memory clock of 2.1GHz can only deliver approximately a third of that headline reference memory bandwidth. A comparison of two sister GT 1030 cards (both designated 'LP OC' - low profile overclocked) from MSI (as pictured above) reveals that the DDR4 cards also suffer from slower core clocks, and the same is true for Gigabyte's low profile GT 1030 siblings. This would further impact any expected performance level a casual GPU buyer might have. 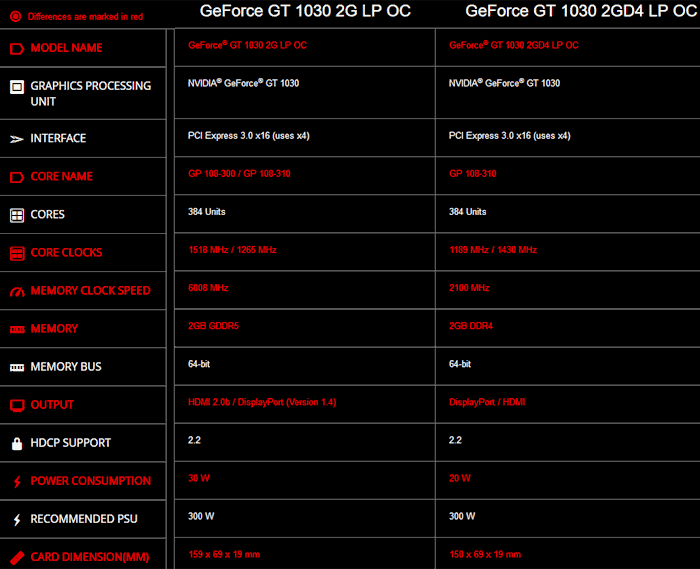 MSI's GeForce GT 1030 2GD4 LP OC specs page at least reveal one benefit to moving from GDDR5 to DDR4: the peak power consumption is reduced significantly, from 30W to 20W. While Gigabyte and MSI at least flag up the use of DDR4 in their graphics card names the same can't be said for Palit which put out a press release describing its GeForce GT 1030 as coming equipped with 2GB of GDDR5. 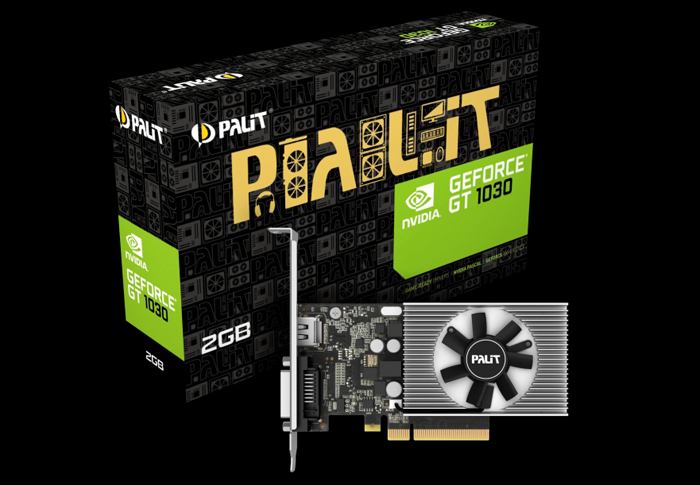 Palit has three GT 1030 cards on sale (tabulated above) differentiated by a single digit in a 17-character product code, though its passive cooled (GDDR5) model is clearly labelled as a 'KalmX' model. Makes sense that they're using DDR4, efficiency is key, it's not like these are gaming cards. It's not a problem about using DDR4 memory, it is problem of naming with the same model name lower performant part. Both clock and memory speed is lower. If you do not know anything about a card, and somebody recommended you Nvidia 1030, you could end up with this one thinking you are getting the one with better specs. The majority of users are not enthusiasts like we are.